A new web site called Capital Bikeshare Tracker is providing a quick view of bike availability at CaBi stations in Rosslyn, Crystal City and the District. The site uses pie chart-style icons on a map to represent the number of bikes available at each station compared to the number of available bike docks. Clicking on a station gives you the option of seeing historical usage data for each station. A map on the Capital Bikeshare web site will only display bike availability data after you click on an icon for the station. 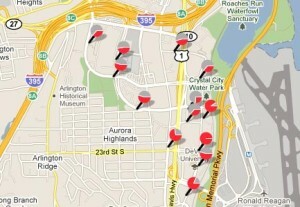 Officials are in the process of adding about 30 stations to the Capital Bikeshare system in Arlington County. They expect the expansion to be complete by the end of the year.